The 16 stations located along the NC Coast in what is now Dare County were were essentially flagships to the National Life Saving Service, and the operations and heroic efforts of their crews would eventually become blueprints to the fundamentals of the modern US Coast Guard. Dozens of incredible rescues took place from the station, and today, that history is honored as the original complex has been transformed into a museum and gift shop, outlining some of the Chicamacomico crew's most daring rescues. On your next trip to the Outer Banks, take an hour or two to explore this significant northern Hatteras Island attraction. 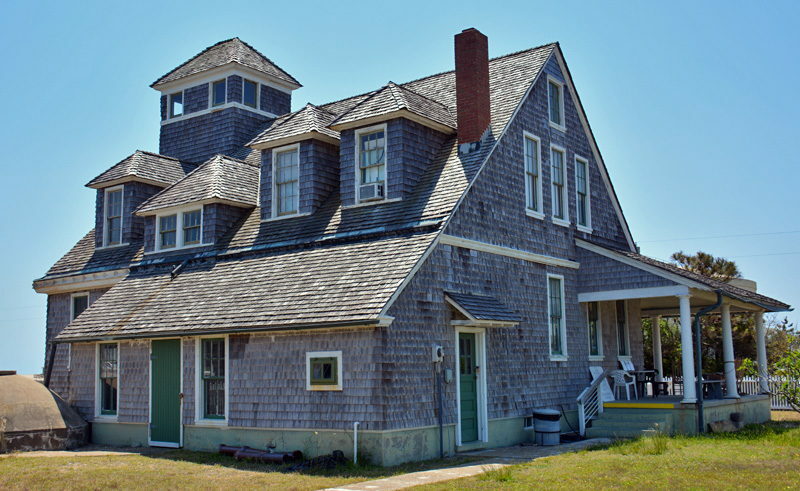 Carefully preserved and protected by dedicated local volunteers, the Chicamacomico Lifesaving Station is an incredible landmark that displays the local culture's inherent bravery, hardiness and pride in a singular wind-swept location. The Chicamacomico station was one of seven North Carolina lifesaving stations commissioned by the federal government in 1871. Congress appropriated $200,000 towards the building and staffing of these stations, an action that was spawned by increasing reports of regular deadly shipwrecks that were occurring off the coast, thanks mainly to the Diamond Shoals. The offshore waters of the Outer Banks have always been dangerous for sailors, as the shifting sand bars of the Diamond Shoals are constantly changing depths and can create sudden "traps" for passing ships that run aground in the more shallow portions. In addition, the two major currents that border the Outer Banks, the Labrador Current and the Gulf Stream Current, add to the unpredictable water conditions, as does passing storms and hurricanes which are abundant in the fall and winter months. While the offshore regions of the Outer Banks are still tricky to navigate for modern mariners, in the 1700s and early 1800s, they were at times downright impassable, and hundreds of ships were lost to the bottom of the ocean floor leading up to Congress' lifesaving station grant. The government hoped that with the right men and right equipment, in the right conditions, lives could be saved whenever the Diamond Shoals claimed another victim. As it turns out, they were right. The building of the station was slated to begin in 1871, but the construction was soon bombarded with issues and headaches. The contractor began work without proper materials, the winter weather interfered with progress at every turn, and the nearly two dozen laborers walked off the job claiming deplorable work conditions. Eventually, the original contractor even threatened the foreman with a gun, claiming he was responsible for the abandonment of the crew. Construction began a second time in 1874, (with a different contractor named D. Simpson), and this time building went a bit more smoothly. The station was officially completed and opened on December 4th, 1874, with Benjamin Pugh as Keeper, and six crewmen stationed on the deserted northern portion of the island. Pugh was the station's keeper for 5 years until he was stationed elsewhere and replaced by Little Banister "Capt. Ban" Midgett, III in 1879. The original station had a keeper's room and crew room, a boat room, a mess room for meals, and a lookout, and throughout the next 20 years, extensive additions were built to supplement the original small stations. These additions included a cook house, cart shed, boat house and an oil house, and the lifesaving station started to form the complex of small buildings that it is today. Unfortunately, the notorious Hatteras Island weather took a toll on the buildings and renovations, and the original station was moved to the back of the property while a new station was constructed. The main station that greets guests today is the "new" station, which was completed in 1911 and fared better in storms than its predecessor, as well as offered much more room for the crewmen and equipment. 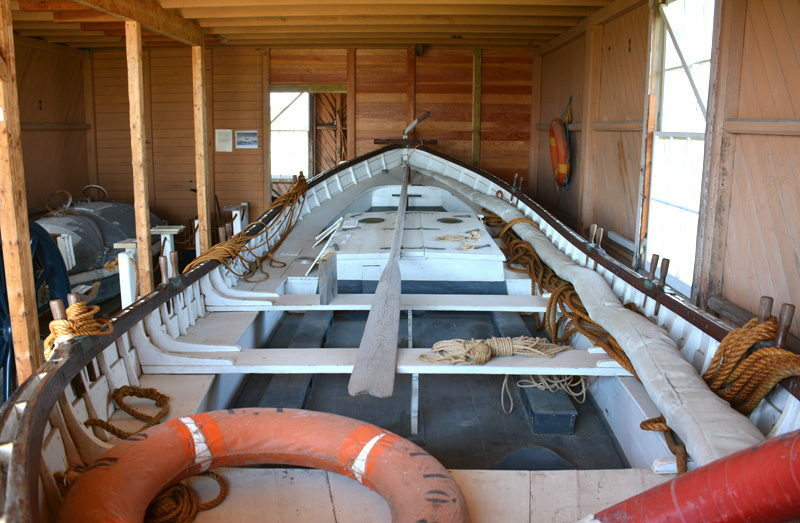 In the years of Chicamacomico Lifesaving Station's operation, the hardworking crew performed countless successful rescues by launching a small boat from the beach and picking up shipwreck survivors. The feats they performed, particularly from the late 1800s to the early 1920s, were nothing short of miraculous, as with nothing but a wooden boat to aid them, the lifesaving servicemen was able to save literally dozens of stranded mariners, (usually entire crews), from marooned and wave-battered ships. One of the most famous rescues, and perhaps one of the best examples of the servicemen's bravery, was the 1918 rescue of the British Tanker Mirlo. The Mirlo was a World War I causality that was torpedoed by a passing German U-Boat off the coast of Rodanthe. Carrying a massive amount of oil, the tanker immediately burst into flames that were literally hundreds of feet high, as the crew bobbed in the water amidst the smoke and fire. The six crew members of Chicamacomico launched their wooden boat from the beach, and proceeded five miles out to where the crew was stranded. Passing through the giant water-logged wall of flames, and navigating through black clouds of dense smoke, the crew made multiple trips to rescue as many sailors as they could. After 6 and a half hours, the crew had pulled 42 of the 51 British sailors on board to safety. In the report of the event, Capt. John Allen Midgett, Jr., the keeper at the time, modestly summarized the night as follows: "Returned to Station 11:00PM. Myself and crew very tired." As a result of this rescue, the six crew members received The Grand Cross of the American Cross of Honor and the US Gold Life-Saving Medal. From a grateful Great Britain they received a Gold Medal struck on order of George VI as well as a Silver Cup awarded to John Allen Midgett by the British Board of Trade. This medal of valor was forged in the late 1800s, with requirements so high that only 11 people total have ever received it. Six of them were stationed at the Chicamacomico Lifesaving Station. Advanced technology (improved Surfboats and Helicopters) allowed for the decommissioning of Chicamacomico and other stations along our coast in 1954. The station was decommissioned in 1954 and the land was given to the National Park Service as part of the Cape Hatteras National Seashore. In 1968, the buildings were bought by the local Civic Association for $500.00, and was then gifted to the Chicamacomico Historical Association, Inc. The land itself was originally handed back to the original heirs, but was eventually sold in a high bidding war to Mr. and Mrs. Walter Davis, who in turn gave it to Chicamacomico Historical Association (CHA) as well. With these combined donations, the CHA finally owned the majority of the original station and set to work completing restorations, collecting artifacts, and turning it into the phenomenal attraction it is today. For its volunteers, the maintenance and operation of the Chicamacomico Lifesaving Station is a labor of love, and the preservation of an important link into our country's history. With so many incredible stories and rescues, visitors are sure to be awed by the lengths these original Life Saving Service crew members would go in order to save a life. The Chicamacomico Lifesaving Station is not only distinguished as one of the most highly-rewarded lifesaving stations of the Life Saving Service, it also has a few modern distinctions and claims to fame as well. For example, the station is the largest and most complete US Life Saving Service station in the country, with every building on the premises listed on the National Register of Historic Places. It's also one of the only original 1874 stations that is open to the public, one of the few stations with all of its original buildings intact, and the only station in the country that is open as a museum. The Chicamacomico Lifesaving Station is open seasonally from April to November, and is accessible for small admission fee. Group Tours are available. When visitors explore the Chicamacomico Lifesaving Station, they'll find they have a collection of buildings to discover located around the main 1911 station's museum and gift shop. Behind the main station is the iconic 1874 station, with its unpainted wood planked exterior, wide opening for boat storage, and ornate details throughout. One of the most striking building in the complex, this original 1874 station has served as an icon for historians, artists and even architects, and its design can be spotted throughout the islands' art galleries and neighborhoods, as a painting, sculpture, or even a "blueprint" for the islands' most striking homes and businesses. 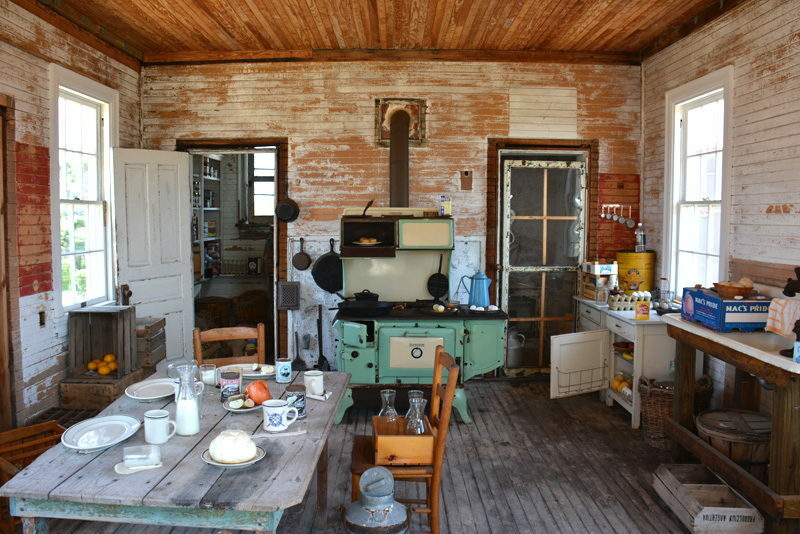 Nearby is the 1897 cook house, where meals were prepared, and the 1907 Midgett House, recreating Island living conditions at the turn of the century. A newer 1911 Cook House is connected to the main building itself, and two horse stables are stationed at the front of the property. In the very back of the property, not too far from the oceanfront, lies a Drill Pole, which was used for Beach Apparatus Drills during the station's operation, and is still used today by our volunteers. The buildings all combine to create an impressive site, and an accurate representation of the daily living conditions of the late 1800s and early 1900s Lifesaving servicemen. The main 1911 building features stunning wooden walls, floors and ceilings, as well as a collection of artifacts and memorabilia from the original station's operations. Many of these items were donated by the families of the crewmen who served at the station, adding a bit of local pride into the fascinating series of exhibits. The gift shop has ample books and collectables that commemorate and celebrate the station, as well as staff volunteers who are always happy to answer questions and share stories of the lifesaving station's history. Station volunteers estimate that a self-guided tour of the premises takes about an hour, although summer visitors will find a number of programs and activities that are wide open to the public, and occur daily on the station's grounds. The most popular of the longstanding summer programs, however, is the weekly Beach Apparatus Drill. The Chicamacomico Lifesaving Station is the only lifesaving station that still offers a demonstration of this drill, a routine that was required to be practiced weekly by all late 1800s and early 1900s lifesaving servicemen. This drill is performed to spectators by active members of the US Coast Guard, and includes live black powder firing as well as live shot. One of the best shows on the beach, this afternoon display is a fantastic way for Chicamacomico visitors watch history come to life, with the aid of modern US heroes. Regardless of whether you come for the daily special events, or just to enjoy a quiet exploration of the grounds, the volunteers who work tirelessly to preserve and maintain the Chicamacomico Lifesaving Station will surely impress your family with their efforts. From the ornate details of the original 1874 station to the eclectic collection of local literature at the gift shop, the station has clearly been artfully preserved, to the delight of Rodanthe Visitors. While holiday visitors may not be able to explore the extensive museum and grounds as the station is seasonally closed, they can enjoy the station in an entirely new and festive light. Typically beginning Thanksgiving weekend, the Chicamacomico Lifesaving Station is seasonally adorned with red bows and white lights that brighten it up for the holidays, and makes it one of the most classically beautiful Outer Banks displays. Bring a camera and a cup of hot cocoa, and snap a few photos of the lit-up station in all its holiday glory. Hatteras Island vacationers will find that there are a number of vacation rental homes that are located incredibly close to the station itself in the small town of Rodanthe, making it easy to view the station and the complex, even from a distance, on a daily basis. Simply check with your local vacation rental company to see what northern vacation rentals they feature that are located adjacent to or are in the proximity of the Chicamacomico Lifesaving Station. Be sure and check out the Chicamacomico Lifesaving Station's seasonal calendar for special events during your stay. The station features a regular series of summer programs that occur almost daily on the premises, and with free or almost-free admittance, participation in one of these fantastic programs is a budget-friendly way to delve a little deeper into the local Outer Banks culture. The Chicamacomico Lifesaving Station is an icon on the Outer Banks for a myriad of reasons. Not only is it one of the most highly-decorated lifesaving stations in our nation's history, with countless stories of almost unimaginable rescues, but it also represents one of the best maintained lifesaving stations in the country. An incredible site for both its history and its painstaking preservation, this station has become a favorite attraction for seasoned Rodanthe visitors, and an incredible hour-long tour for newcomers who want to learn a little bit more about these picturesque barrier islands. With a long and tumultuous history, incredible exhibits, and well-preserved relics, the Chicamacomico Lifesaving Station is a must see for any Hatteras Island vacationer staying in the village of Rodanthe, or just passing through on NC Highway 12 en route to the southern Outer Banks beaches. 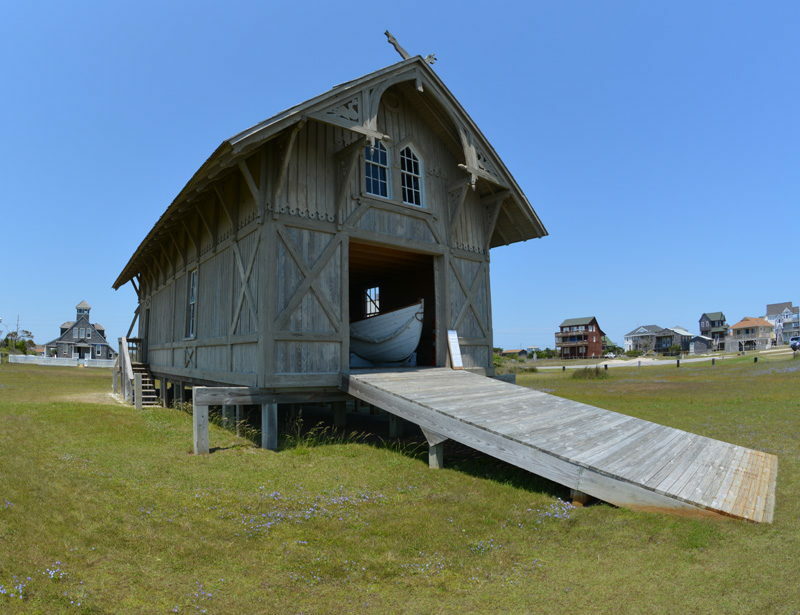 Be sure and make a stop on your next Outer Banks vacation, and you'll find that the centuries of fascinating maritime history to be found at the Chicamacomico Lifesaving Station is well worth the nominal price of an admission ticket. Where is the Chicamacomico Life-Saving Station? The Chicamacomico Life-Saving Station is located in the town of Rodanthe, which is the northernmost community on Hatteras Island. How do you get to the Chicamacomico Life-Saving Station? Visitors from the northern areas of the Outer Banks can reach the Chicamacomico Life-Saving Station by heading south on NC Highway 12. The Chicamacomico Life-Saving Station is about a 30 minute drive from the town of Nags Head. When was the Chicamacomico Life-Saving Station built? The Chicamacomico Life-Saving Station was first constructed in 1874, and the original 1874 station is still located on the premises. The “main station” building, which is the largest structure on the site and is where the museum is housed, was built in 1911. Is the Chicamacomico Life-Saving Station open for visitors? The Chicamacomico Life-Saving Station is open for visitors to explore. 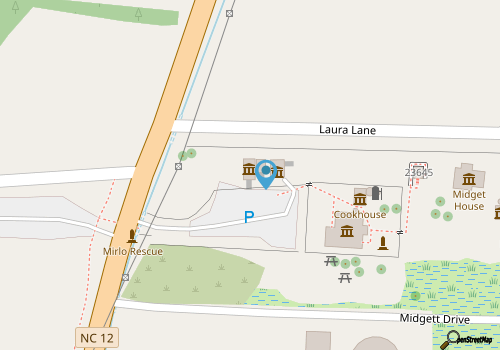 Buildings within the complex include the 1911 Life-Saving Station and museum, a small 1897 boat house, a 1911 Cook House, the 1907 Midgett House, the 1892 Cook House, and the original 1874 station. Is the Chicamacomico Life-Saving Station open year round? The Chicamacomico Life-Saving Station is open for the majority of the year, and generally from early spring until the late fall or early winter. It is also decorated annually for the holidays in December. What are the special events at the Chicamacomico Life-Saving Station? The Chicamacomico Life-Saving Station has a number of seasonal summertime events which includes weekly beach apparatus drills, special talks and programs, and even live music. Visitors can check out the Chicamacomico Life-Saving Station’s website for upcoming events and weekly programs. How long was the Chicamacomico Life-Saving Station operational? The Chicamacomico Life-Saving Station was established in 1874 and was a heralded Life-Saving Station for more than 75 years. It became part of the U.S. Coast Guard in 1915, and was finally decommissioned in 1954. Why is the Chicamacomico Life-Saving Station important? The Chicamacomico Life-Saving Station was the first Life-Saving Service station that was staffed in North Carolina, and the current site is one of the few remaining Life-Saving stations on the East Coast that is open to the public. Most notably, the crew at the Chicamacomico Life-Saving Station took part in one of the most heroic rescues of all time according to the US Coast Guard, which was the 1918 rescue of 42 sailors from the British tanker Mirlo, which was torpedoed by a German U-Boat during World War I. What are the rescues that happened at the Chicamacomico Life-Saving Station? How do you pronounce the Chicamacomico Life-Saving Station? How did the Chicamacomico Life-Saving Station get its name? Chicamacomico Life-Saving Station was named after the town where it resided – Chicamacomico, which is now present day Rodanthe. Originally named after a local Native American tribe that was settled in the area, the town name Chicamacomico was changed to Rodanthe in 1874. Is there a fee to visit the Chicamacomico Life-Saving Station? There is a small fee to visit the Chicamacomico Life-Saving Station which includes entrance to the 1911 Station and present-day museum, as well as the other structures on the site. There is a discount for students, children, and senior citizens, and 100% of fees go to benefit the restoration and operation of the site. Is the Chicamacomico Life-Saving Station a museum? 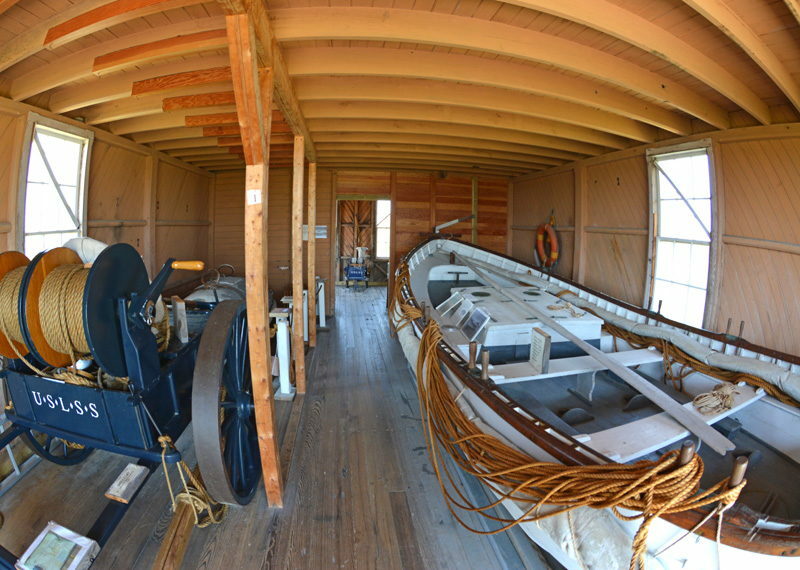 The most modern structure within the Chicamacomico Life-Saving Station site, which is the 1911 station, is a present-day museum that is filled with exhibits from the Life-Saving Service and later U.S. Coast Guard. A number of other buildings at the site can also be toured, and have been renovated to represent their original condition. What exhibits are at the Chicamacomico Life-Saving Station? 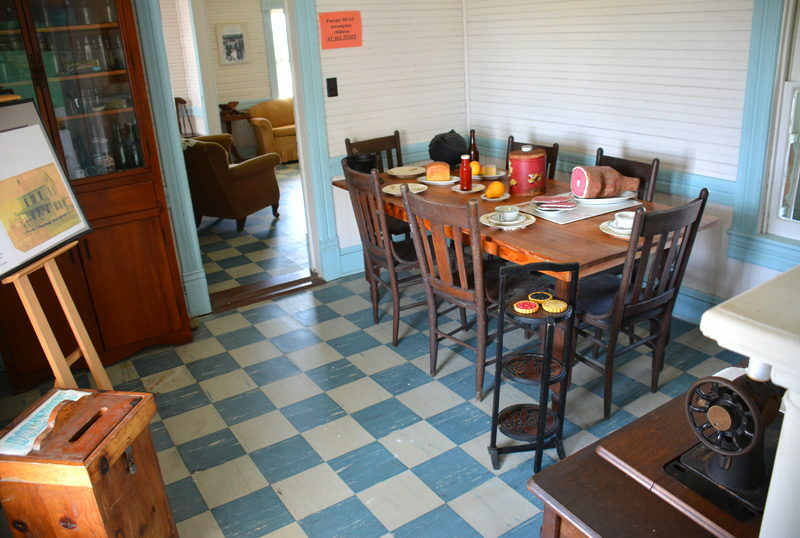 The individual buildings within the Chicamacomico Life-Saving Station serve as their own living history exhibits, with sites such as the 1911 Cook House and 1907 Midgett House completely restored and furbished to represent the life of the Chicamacomico surfmen in the early 20th century. In addition, the expansive 1911 station has a host of exhibits that chronicle the surfmen through attire, memorabilia, tools, and other unique artifacts. Does the Chicamacomico Life-Saving Station have a gift shop? The Chicamacomico Life-Saving Station does have a gift shop, which is housed within the main 1911 station. 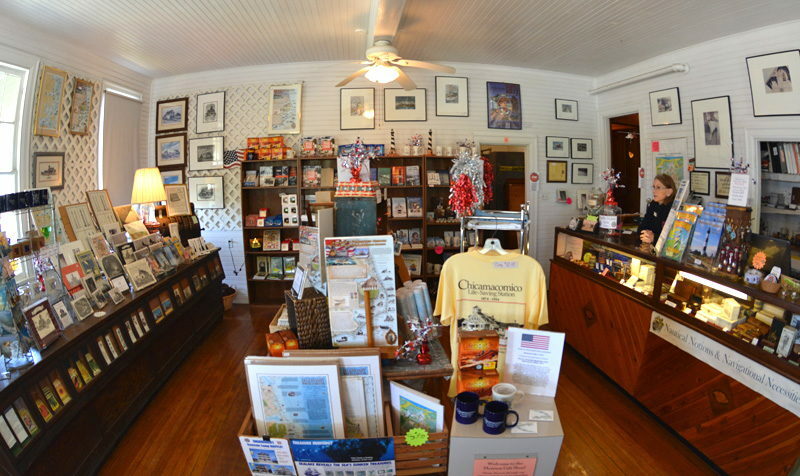 The gift shop features historical books, memorabilia, gifts, and other treasures that pay homage to the Hatteras Island area’s maritime history. Who owns and runs the Chicamacomico Life-Saving Station? The Chicamacomico Life-Saving Station is managed by the Chicamacomico Historical Association, which is a private and non-profit organization whose purpose is to preserve, restore, and interpret the history of the station itself, and the local U.S. Life-Saving Service. What are the buildings at the Chicamacomico Life-Saving Station? Call 252-987-1552 for current hours.